Brothers Dan and Greg Martino got into the oyster farming business after taking a farm tour. Back home, they promptly jumped to work on a local farm, Sweet Neck Oysters with proprietor Jack Blake. After learning from the best, the Martino brothers set out to get a farm of their own. 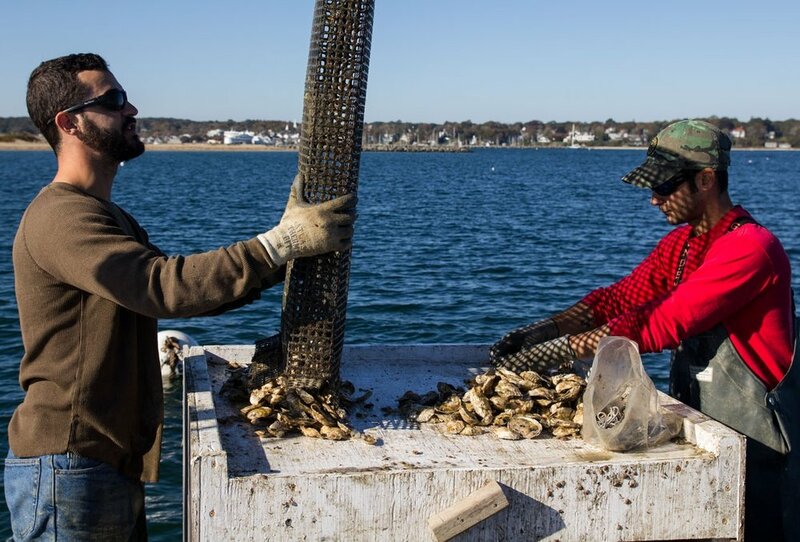 Three and a half years later, in 2014, they were granted the first oyster farm in Oak Bluffs history, and the first open ocean oyster farm in New England. Named after the original town name for Oak Bluffs (The Cottage City), Cottage City Oysters was created with the hope of .."growing the best damn oysters that we can in the most environmentally positive way possible". Our mission is simple: Provide the best oysters in the most eco-friendly, sustainable way. We strive to do this while providing education and support to our local community. Surprisingly, the eco-friendly and sustainable part is the easiest. Oyster farming is a very organic practice in and of itself. No food or chemicals are used because all of the food is already present in the water column, and the method of cleaning the oysters is done by the Sun, drying the seaweed and barnacles until they fall off. Our raft and equipment is created using the most environmentally friendly choices. No pressure treated chemical wood is used on the farm, and all of our raft equipment is powered by solar electricity, which reduces the potential for gas spills and emission / noise pollution. The oysters get their good looks and taste from a lot of hard work and a clean environment. Like wine grapes, oysters get their taste from the environment they are grown in; it's called Merroir. We are blessed to be able to grow Cottage City Oysters in one of the best environments in the world, known for the cold, clean, swift moving currents of the Vineyard Sound. Martha's Vineyard is renown for clean water and environmental stewardship. Our focus is to protect, maintain and improve the local environment. We think of our farm as not only a space to produce food, but also as a playground for scientists and educators to test new research, designs and programs. Below are some of the partners we have teamed up with on various scientific and educational platforms. 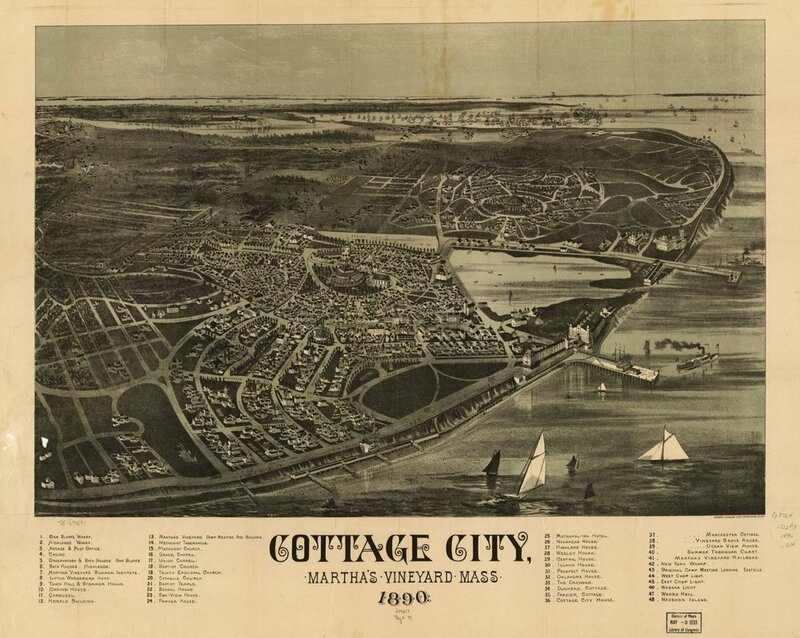 Originally incorporated in 1880, Cottage City embraces the northeastern extremity of the island of Martha's Vineyard, Dukes County; and is mainly a place of summer residence, having only the business relating to such occupancy. The town has the ocean on the north and east, Edgartown on the south, and Tisbury on the west and northwest. It is separated from the latter town by Vineyard Haven Harbor and by Lagoon Pond, the latter partially divided from the harbor by a broad sandbar. The coast is formed by steep sand-bluffs, with sandy beaches at their bases. The area, aside from highways and water surfaces, and some sandy marsh, is 1,965 acres. About one third of this is largely occupied by scrub oaks, with trees of larger growth in the vicinity of the camp-grounds and some of the older residences. In 1907 the town's name was changed to Oak Bluffs, because of the growth in the year round population and the changing face of the resort required an acknowledgement that the town was not just a "Cottage City" any more.